We all know our assignments because we’ve rehearsed the plan many times before, and we know exactly how long it takes to make a great impression. 9 minutes 57 seconds: My wife removes emergency cookie dough from the refrigerator and pops it in the oven, ensuring a lovely baking aroma when the guest arrives. 8 minutes 4 seconds: I place our college transcripts with our impressive GPAs in the bathroom medicine cabinet, just in case the guest snoops around. 7 minutes 40 seconds: I turn off the Bee Gees and turn on jazz bassist Charles Mingus’ greatest hits. 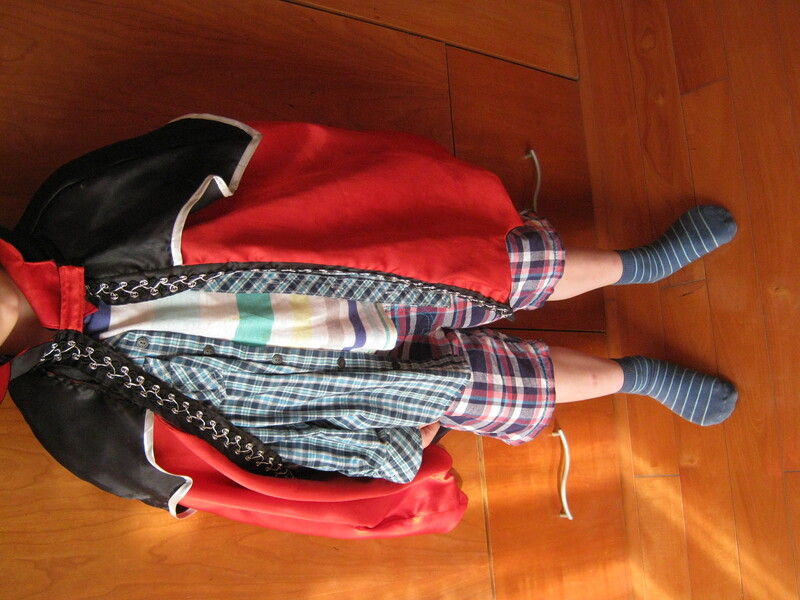 6 minutes 50 seconds: Our sons change into the clothing I have carefully selected to display their individuality. 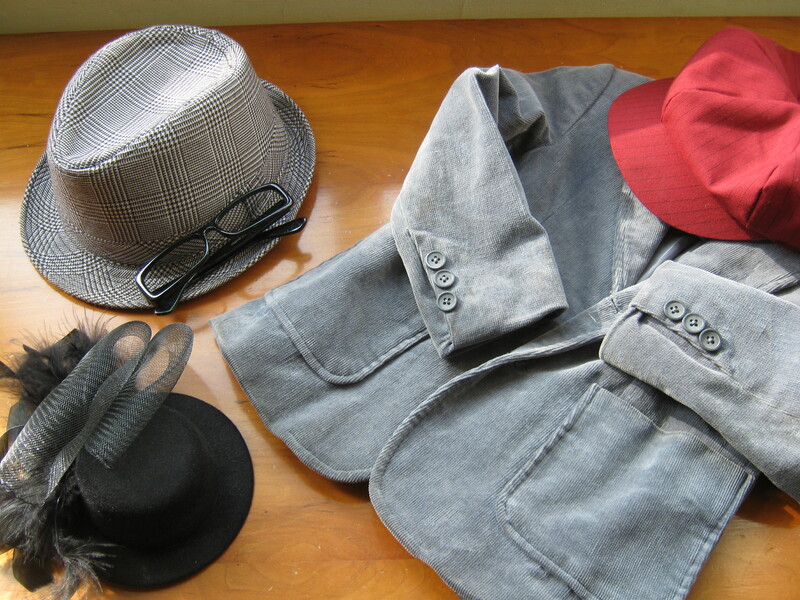 My nine-year-old will play a hipster and puts on dark jeans, an argyle sweater vest, black glasses without lenses, and a black-and-white plaid fedora. My seven-year-old puts on a tiger t-shirt, blazer, and a newsboy cap–I call this style The Professor Newsboy (copyright pending). I say my kids “change into”, but I’m not sure you can technically “change” if you weren’t wearing a shirt or pants to start with. 5 minutes 11 seconds: I collect all our copies of the British celebrity rag Hello magazine and replace them with The Economist and Harvard Business Review. We already have copies of impressive books on the coffee table, but I blow off the dust and open John Steinbeck’s very thick East of Eden to the mid-way point and dog ear multiple pages in the first half. 4 minutes 4 seconds: Many of our friends are European and we usually greet each other with the Continental kiss on both cheeks, so my wife and I exchange a quick Continental sniff to assure each other whether the guest will detect any need for a shower. We also remind each other to always start the kiss on your left side, because if the guest goes to his left and you go right, you end up kissing on the lips, which has happened to both of us in our early Continental-kissing years. 3 minutes 11 seconds: I remove the DVDs Love Actually and The Karate Kid off the top of the DVD players, and replace them with Jean Renoir’s French masterpiece The Rules of the Game. If I’m asked about the film, I will use the term “mise-en-scène” in describing the visual style of the film. 2 minutes 4 seconds: The kids turn off their video games. My nine-year-old sits on the couch and reads The Great Gatsby. My seven-year-old sits next to an easel, holds a paintbrush, and pretends to be adding a tree to a landscape painting I bought at a yard sale. 1 minute 40 seconds: My wife and I review a notepad full of witty stories and recent accomplishments to mention. We take turns telling anecdotes about the children while the other partner tries to appear deathly bored to remind us nobody besides us thinks our kids are cute. 0 minute 14 seconds: My wife places a tiny hat on our cat Megatron, a step that must be done last because it only takes her two minutes to get it off. Ding-dong! Who’s that at the door? Someone who’s about to be impressed. How impressive are we really? I swear my seven-year-old, the Fonz, wore this to school today. How did his mother let him out of the house dressed like that? Actually, I'm the one who takes them to the bus before work every morning. I swear we can do this all in ten minutes, and when I look around at how efficiently my family works together to appear impressive I always think, isn’t our impressive coordinated effort at appearing impressive just as impressive as actually being impressive? My daughter wore the same shirt everyday to school in 5th grade. Now, at 20, she changes her outfits 4, 5, 6 times a day. So don’t worry about your son, by the time he’s in college he’ll find another way to dress that will annoy you. As long as his clothing isn’t covered in food at twenty, I’m sure I’ll be supportive of his style choices. That’s easy. One rule – You can’t go on a date until you can eat without food all over yourself or tipping your milk over. Seems like a long way off for this rule to be effective. Trust me, it’ll take that long to accomplish with boys. One still uses a Tupperware sippy lid at my house and he’s a 24 year old chemical engineer. ah, savesprinkles123 stole my line!!!!! Now THAT was impressive as well! So if I call that I’m around the corner and call saying I’m stopping by, I’ll know all your little secrets and know that it’s all a bunch of melarchy(auto spell check isn’t picking that up so I’m not sure if that’ right or not). We do have a thirty minute plan to impress the people who already know the ten minute plan. I like your definition of emergency. Hilarious as always. I especially enjoyed the reference to Hello! I, of course, would leave the Bee Gee’s playing, especially if it was Nights on Broadway. Screw the guests, that’s an awesome song. Nights on Broadway is one of my favorites. I’m not ashamed of my love for the Bee Gees, but I can’t seem to convince other people to find them impressive. The early continental kissing years are the worst. Much like the late continental breakfast. It took me a long time to feel comfortable with the Continental kiss, but I can proudly report I haven’t accidentally kissed someone on the lips for years. Who wears the ascot and monocle? If I had an ascot and monocle I would wear them every day. “6 minutes 50 seconds: Our sons change into the clothing I have carefully selected to display their individuality”…. Love that line! It is important define your childs individuality for them. “We do have a thirty minute plan to impress the people who already know the ten minute plan.” …I’d like to see the 30 minute plan rolled out in my honor, please. Does that one involve calling in the video crew and setting up lights to demonstrate that your family is SOOO imressive, you’ve been made the subject of a new reality TV show??? Because that would be really impressive. The thirty minute plan involves tricking the guest into “accidentally” stumbling upon the secret passage leading to our science experiments. I’ll be there in 4. Just get the cookies in. You’re welcome to stop by unannounced, but we’re likely to make you wait on the doorstep for ten minutes. I say my kids “change into”, but I’m not sure you can technically “change” if you weren’t wearing a shirt or pants to start with. I would like to be there about 3 minutes and 45 seconds after your guests arrive so I can watch the look of astonishment on all of their faces…and then open the closet door where you have stashed all of your sub-par intelligence DVD’s, video games and books and watch them spill out onto the foyer floor…Okay, maybe I wouldn’t do that, but it would be fun. You have just talked yourself out of an invitation. If the Fonz and my #4 ever meet up together, nobody’s ever going to mention Beatrice’s fascinator again. Can we please have a picture of Megatron? I’ll try and get a picture of Megatron in her tiny hat. She just won’t hold still for a picture once she gets that hat on. I’m impressed that your cat’s name is Megatron. I did write a post about Megatron, but it was a few months ago. Oh you bring back the memories of a life once lived. Love the satire because I always despised the pretensions some people feel are necessary. I always thought you should put out Karate Kid in order to impress. I reserve my two hour speech on the merits of The Karate Kid for people I truly like. Your ideas sound great for getting me attention, but I’m trying to do something that brings the whole family together. This is just great. You guys make such an adorable family unit. Wait a minute – is that just a ploy to impress us? You’ve seen through my scheme. Very impressive. Item #1: I think you’re confusing the “making an impression strategy” with “selling the house strategy”. Instead of cookies, consider whipping out a Smith & Hawkens basket of free-range chicken eggs and arugala that you keep ready for such an emergency. Have your wife swipe a bit of dirt across her cheek to imply she’s just come in from your organic garden. The organic garden is part of the more elaborate thirty minute plan. “Ah, the thirty minute plan..” she said knowingly, nodding her head. You might consider developing other looks for your sons so you could easily swap personas based on the type of guests who were coming. Instant conversation starters, I say. Your style ideas are making me wish I had more children so I could choose identities for them. Yes. More children. Soon, please. They’ll be endlessly impressive. And I must beg to differ: there is at least one “TheMom” out here who thinks your kids are cute. Send them over. I like what Fonz is wearing in the pic. It’ll work just like cammo over here. BTW, I might show up next summer. Get cooking on that 13 month impressiveness scheme. You’d better have a monorail built in your living room by then. A thirteen month heads up is enough time for us to become genuinely impressive. I really only need a year to work my way up to be head of an international crime syndicate. I find that carrots purchased from the farmers market with their leaves on will keep for ages. You can bring them out repeatedly for guests, lay them on a wooden chopping board on the counter and place a sprig of fresh herbs next to them. (Rosemary always maintains its form even when dry). An arty cookbook will set these off, showing how you are just planning another of your inspired dishes using only the finest, freshest ingredients that you grew yourself. How healthy, self-sufficient and delightfully rustic of you. Great idea, although I hope the guest isn’t offended if he’s not invited to stay for dinner and share in our fake meal. I clearly need to step up my game. I usually just hide dirty laundry in the closet, close the blinds so as to mask the dust-covered everything, and give the lemon-scented Febreze a good squirt. Oh, and I put on a bra. Nothing says “I’m trying” like a properly supported bosom. I want to write a fan letter to Febreze, thanking it for all the social gatherings it’s saved over the years. I imagine you’ve had several practice runs, even dress rehearsals, so I’m very impressed. If all you need is 10 minutes, imagine what you could do with a year’s notice. Consider yourself notified. One year. Now spring into action! Are you suggesting if we dedicated our rehearsal time to actually developing ourselves, we might become genuinely impressive people? Yes, SaveSprinkles beat us all to the punch. We bow down to you with impression. We have a house cleaner, and we don’t worry about hiding our mess before she arrives, but we do worry about hiding evidence. Hmm … It’d be better if he could be writing an essay on it for Harper’s, while the other one works on a New Yorker cartoon featuring twelve mice and a cat seated around a boardroom table. I guess we’d have to work it out by thumb wrestling. Or a few hands of poker. I wonder what would happen if you had a crossbow leaning against your couch, if your kids wore beige fatigues, and if Machiavelli’s The Prince were sitting on your coffee table? If nobody wants it, I’ll take the crushed velvet cordoroy blazer. I have boots that need a riding jacket. I wonder that, too. I wonder so much that I might actually do it. So…is the cat’s hat a tiny version of Princess B’s fashion disaster? I’m flattered by the blogroll addition. If I ever make it to Hammond River I’ll come to your bookstore and buy all your P.G. Wodehouse. The tiny hat has been worn by our cat a couple times, but it wasn’t purchased as part of the new hat craze. It actually belongs to my wife who tried to start an ironic teeny tiny hat trend last fall, but she couldn’t get anyone else on board. It’s possible the yard sale landscape painting was a Bob Ross original. If he painted a landscape every week for decades there must be a lot of his work out there. According to Wikipedia, “A commune is an intentional community of people living together, sharing common interests, property, possessions, resources, work, and income.” Communes were especially popular in the 1980s and 90s, but there are communes still around today. At what point does a commune became so large that everyone involved has to spend all day preparing to impress the other members of the commune? In The Republic Socrates limits the size of the ideal city and suggests it should not grow so large that the citizens can no longer personally know their representative. I think this philosophy probably extends to the ideal size for a commune–the commune should not grow so large that some people miss out on being impressed by my family. I usually just throw the giant pile of laundry in the bedroom, shut the door, and call it good. That’s what we do when the guest shows up unannounced, but if we have ten minutes we can make some magic happen. LOL… i’d agree with Tori, closing the blinds – and ensuring there aren’t any rogue drafts by shutting the windows too. That way, it’s too dark to notice that the carpet is actually brown (not orange and white), and just covered in a layer of dog-hair. Preventing drafts ensures that the dog-made tumble-weeds don’t go blowing through and startle our guests and make them worried about a hamster invasion of some sort. I like the idea about people not being allowed to show up for 10 minutes… it would mean I’d have more of a chance to NOT be still in my pj’s when i answer the door. Nothing says ‘welcome’ like boxers and a shirt with ‘DANGER’ written on it. We only have a couple friends who we allow to drop in without calling first, and they’re the kind of friends who are already wearing pajamas when they arrive, so there’s really no impressing them. I’m sure you practiced it many times so probably you could do it in your sleep, but in the beginning did you have a list? I should learn from you, my idea of impressing the guests is to bring a chair from the kitchen to the living room so that they don’t have to sit on the floor and my dirty carpet. I didn’t have a list, but I did have a PowerPoint presentation. Love Renee’s crossbow and cammo idea. If you go with it (and you totally must), I suggest mentioning in converstaion that your son’s middle name is “Danger”. I’ve actually done this myself on several occasions (the quick change, not the crossbow). It’s nice to know I am not alone on the accidental lip kissing thing is well. Ah, confirmation. 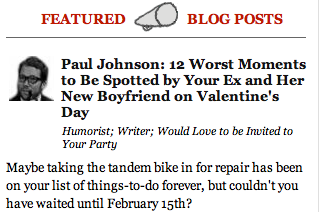 You never cease to delight and amuse, Paul. Your blog is my #1. I shall work on a suitable plaque. You are too kind, but when I say “too” I don’t necessarily you’ve gone too far. I encourage you to continue to say kind things. I like the outfit your kid wore to school today — it’s very practical. He can probably get away with wearing the same set of clothes for 3-4 days by just switching the layers around. I’ve never been able to master the Continental kiss — I start out okay but then I overestimate the distance I need to pull back to clear the other person’s head, and those extra inches cost me precious seconds in the race to the second cheek. I should probably take lessons. You mentioned having to put hats on your kids and your cats, but not yourselves — what kinds of hat do you and your wife wear for lounging around the house? I wear a straw fedora, and my wife wears a teeny tiny hat. You have to look really close to even see it. If I had a top hat I would wear it. I’ve been looking for a top hat in my size for ages. Once again I am chuckling and saying to myself – how often was this the case when the house was full of children, one husband and two dogs? Now the house is presentable most times – it’s now full of only me and one little dog. We make very little mess. I love the idea of a hat on the cat – or a Hat and a Cat – my children’s favorite Dr Seuss when they were growing up all those years ago. Don’t know if Lotte My Tibetan Spaniel will sit still long enough to put a hat on her. But hey, that’s something I can try today. Keep the humor coming please Paul. I think in this world of disasters, famine, panic and conspiracy theories we need your input into our lives. Thanks, Judith. You don’t know how much I genuinely appreciate that. oops – memory slipping – of course it was A Cat in a Hat. You keep your college transcripts in the medicine cabinet? Similarly, that’s where I keep my Karaoke awards. If only they gave out awards at the place I go for karaoke. I used to karaoke once a month, but nobody ever gave me an award and without knowing how I ranked against the other singers I slowly lost interest. If you can’t impress your friends with the Bee Gees, then maybe they’re not worth being your friends. I have the same thing with Abba. I’m a huge ABBA fan as well. I’m sick of conversations where I have to explain how genius the Bee Gees and ABBA were. I have to turn the Bee Gees and ABBA off because it’s not impressive if the guest says the Bee Gees were only okay, and I have to punch him. Guess I’d better keep my mouth shut, then. Our friends know we must be tricked in to answering the door as the constant shuttling around of our Offspring leaves us utterly exhausted and not wanting to carry on conversation of any sort- the mailman and policeman disguise will usually gain them entrance. But I bet you’re shuttling your offspring around to all sorts of impressive activities. I usually go for rude rather than impressive. I went through that a few days ago when 2 guys with a Bible showed up. Unfortunately, standing outside didn’t phase the one who liked to talk. I hate to be rude by telling you to wait outside for ten minutes, but I’m really doing you a favor by giving your life new meaning and inspiration through the impression you’re about to get. Now I know to never give you ten minutes. I’ll just ring the doorbell, and then we’ll see just how impressive you really are! You’ll be ringing that doorbell a long time, Binky–ten minutes to be exact. I’ll be Megatron is the most impressive of all the Johnsons. I mean really, what says ‘cultured’ more than tiny hats? In the cat world, wearing any clothing is pretty impressive and should be considered ‘cultured’ to the rest of the cats. It’s a fine thing someone as impressive as you doesn’t live in a home such as mine. Otherwise with all this culture and planned individuality emanating you would completely forget that the entire house looked like it had been shaken in a snow globe and would require another half hour to salvage. What do you when they adamantly say they will show up in less than ten minutes ? Which step do you dare sacrifice? Don’t say it’s the kitty hat! Instead of the cat hat, I will allow the cat to escape out the door when the guest arrives, and I will blame the guest, guilting him into searching for the cat for ten minutes and giving us more time. Never a door-to-door salesman, but once a door salesman. What kind of warning did you call out before I showed up and the whole family was lying on the hideaway eating popcorn and watching cartoons in their underwear? You’re one of the few people allowed to drop in announced. We know you’re already sufficiently impressed. I would say it’s a guilty pleasure, but I don’t feel very guilty. Poor Megatron? Don’t feel sorry for a cat whose owners care enough to dress her up in little hats. That’s the feline high life. College transcripts in the medicine cab? Brilliant. The Megatron story was also hilarious. Thanks for the link! Is there a better place to keep college transcripts? Oh my heck. Just noticed you posted A PHOTO of the ACTUAL tiny hat for Megatron. Bless you. And bless that cat. I really did read the Great Gatsby! Not too shabby for a nine-year-old. You must have great parents. My preparations are more low-key. Taking inspiration from popular Scottish comedian Frankie Boyle, I now shave the word “Welcome” into my dog’s back. The advantage of this is it initially distracts attention from the fleas. The disadvantage of this is it eventually attracts attention to the fleas. I usually take just the opposite approach, I keep a Durian in a freezer, just pop that dude in the microwave for 30 seconds. Ya know, I’ve never had to further the plan. Everyone insists on sitting on the patio for some obligatory minimum of time where their ears may be greeted by the musical stylings of the John Tesh Project blasting from the working side of an old boom box. They can thumb through the latest issue of Modern Mercenary Magazine, while I complete the hospitality by offering them a glass white Zinfandel in a coffee cup with broken handle. @infinitemonkey–brilliant. That’s a tack I could take. Paul has set the bar too high for actually impressing people, so I’m in your camp. Lower that bar. Drive them away quick. Thanks for the inspiration. 2 minutes 4 seconds had me laughing out loud. God, your hysterical! You had me at Charles Mingus and East of Eden. I’m also impressed by your “flight of the bumblebee” choreography to become impressive. IT WORKED! Twice impressive! It takes me about 30 minutes to look effortlessly beautiful. You’ve laid down quite a challenge now. I’m going to see if I can shave 21 minutes off my time and still get those effortless curls I so desire. You impressed me at Bob Ross. No doubt the 30 minute plan.